In just four days, heads of state, policymakers, and experts will gather in New Delhi for the third India African Forum Summit from October 26-29. Key issues on which participants will focus include public health, U.N. Security Council reforms, terrorism, and climate change. Another major area of focus will undoubtedly be the growing trade and investment relationship between India and Africa. In preparation for the approaching summit, the Africa Growth Initiative looked into the big picture dynamics of Afro-Indian trade and investment. The International Monetary Fund has determined that the value of India’s exports (now largely high-end consumer goods) to Africa have increased by over 100 percent from 2008 to 2013—meaning that India has now forged ahead of the United States in African markets. However, although they benefited from Africa’s robust economic growth, India’s gains do not quite compare to China’s astronomical increase in exports to Africa (Figure 1). The value of India’s imports from Africa also grew dramatically from 2008-2013—by over 80 percent—compared to the sharp decline in the value of imports from sub-Saharan Africa to the United States The decrease in U.S. imports from Africa was likely caused by the development of American hydraulic technology, which lessened U.S. dependence on African oil and gas—its major import from the continent (Figure 2). Despite the impressive growth of increased trade relations between India and Africa, there is a substantial imbalance in the import-export relationship between the two countries. A vast majority of exports from Africa to India are raw materials such as crude oil, gold, raw cotton, and precious stones. 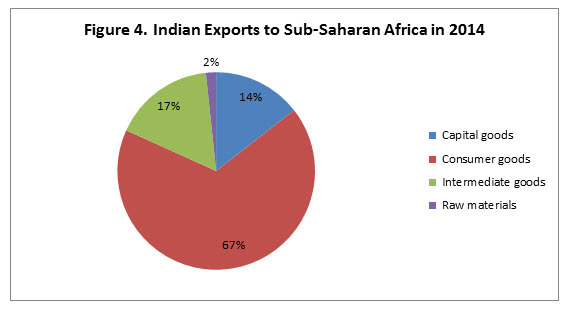 Meanwhile, most exports from India to sub-Saharan Africa consist of high-end consumer goods such as automobiles, pharmaceuticals, and telecom equipment (Figure 3 and Figure 4). This imbalance does not necessarily align with Africa’s goals to diversify away from natural resource dependence, which is a common issue in Africa’s trade relationships with China, the U.S., and the EU. 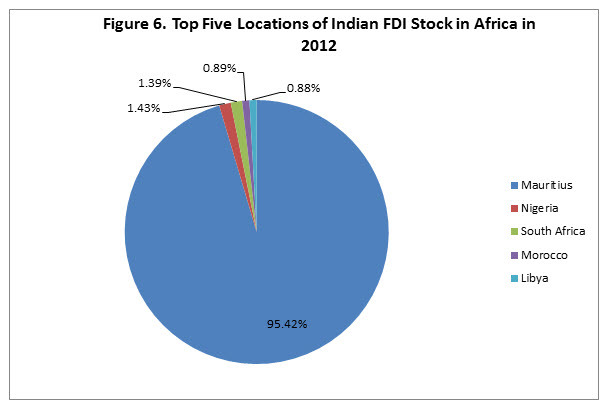 Another noteworthy trend is Africa’s growing foreign direct investment in India. Since 2010, Africa’s FDI in India has proven consistently high compared to its FDI in countries such as China and the United States. However, the primary reason for this is that Mauritius is the biggest source of FDI into India. (Figure 5 and Figure 6). Source: UNCTAD Bilateral FDI Statistics. Although India’s FDI in Africa has also increased, with an 11 percent jump between 2010 and 2012, Indian investments are concentrated in just a few countries. Once again Mauritius attracts a high volume of investments from India due to its favorable tax treaty with India (Figure 6). Overall, the Indo-African economic relationship has made substantial gains, but there is much more room for growth. Of many of our recommendations, we suggest that, in looking forward, African businesses should focus on diversifying their exports to India by increasing awareness of preference opportunities—a strategy that could also mitigate the effects of a recently shaky Chinese economy. India in turn should focus on expanding its preferred areas of investment beyond the few countries on which it currently focuses. This year’s India Africa Forum Summit presents a pivotal opportunity to engage in dialogue on solidifying and expanding upon this growth. For more information and policy recommendations, see Priorities for Enhancing the Indo-African Commercial Relationship by AGI’s Amadou Sy and Andrew Westbury, featured in the Brookings India publication India and Africa: Forging a Strategic Partnership.